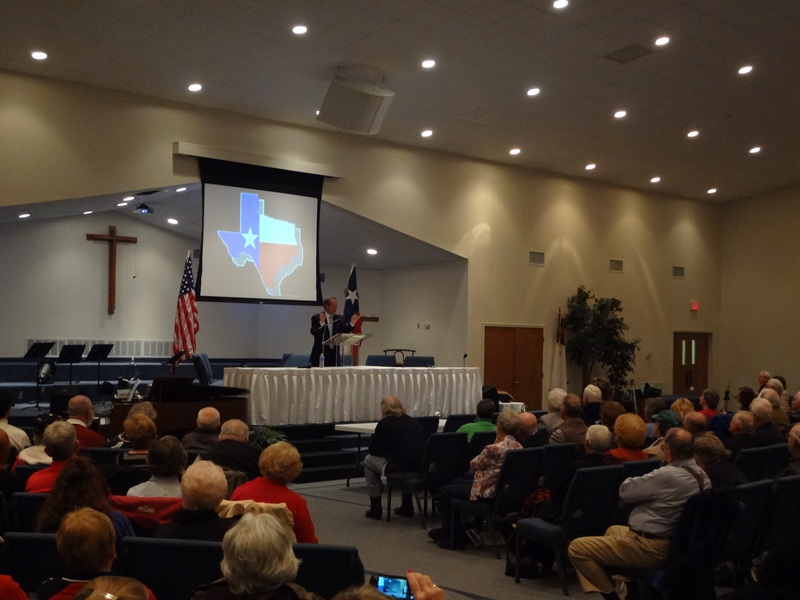 On a cold and wet morning this past Saturday, hundreds of Texans packed the Lakewood Church of the Nazarene in Tyler, TX to take a stand for religious freedom and to educate and encourage pastors and their congregations to stay informed about important issue of faith. Local pastors and state and national leaders, including Liberty Institute’s President Kelly Shackelford, laid out how our religious liberty is under assault. The first amendment has rarely been attacked so openly and overtly like what we are seeing today. Just a few recent examples include: (1) the Obama administration’s HHS mandating that Catholic institutions and other religious organizations must provide abortifacents and birth control in violation of their own teachings and conscience, (2) the Obama administration challenging the right of churches to hire their own pastors and employees based on their religious beliefs at the U.S. Supreme Court, and (3) liberal activist groups like the ACLU trying to tear down crosses at our veteran’s memorials around the country. The genesis of the God and Country movement in fact started here in Texas last December when an atheist group called the Freedom from Religion Foundation demanded that a Nativity scene in Athens be removed from the court house lawn. In an inspiring show of support for religious freedom and the true meaning of the first amendment, thousands of people gathered in Athens on December 17, 2011 to stand against the ever growing attacks on Christians and people of faith. As a result, the first amendment prevailed and the Nativity scene was not removed. If there ever was a time, the time is now for people of faith to take a stand and for pastors to lead their congregations in engaging in the important issues of faith going on in our culture. One of the most important ways they can do that is to inform and encourage people of faith to vote. As we are in primary election season, it is important for churches to know that they can register their members to vote, to pass out and encourage their members to use our voters guides, and for pastors to know that they can speak out on important issues like religious liberty as they feel lead to from the Lord. 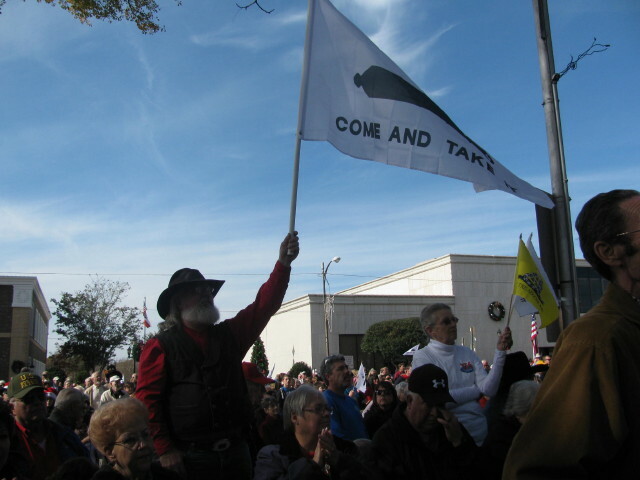 As witnessed in the God and Country Rally, we are excited that people are starting to wake up and see what is at stake. We look forward to continuing to be part of the fight to reclaim and defend our religious freedoms, and it certainly will be one of our top priorities as we head into the next legislative session. Watch Our Video on Texas Sonogram Case Victory!! By the way, big thanks goes to Attorney General Greg Abbott and Texas Solicitor General Jonathan Mitchell for doing an excellent job defending the Texas Sonogram law!! Liberty Institute’s Director of Legislative Affairs, Jonathan Saenz will speak this weekend at the Texas Tribune Festival. The Festival is a weekend of debate, discussion and dialogue regarding politics and public policy. It takes place Saturday and Sunday, September 24-25 at the University of Texas at Austin. Find out more or register here. Jonathan Saenz frequently presents testimony in defense of conservative values before the Texas Legislature and the State Board of Education. He will be taking part in the panel discussing: “What Now for the State Board of Education?” The discussion promises to be lively because the panel also includes Kathy Miller of the liberal Texas Freedom Network, a group that targets people and elected officials for their religious beliefs (and usually loses policy votes too). Former Chairman of the SBOE, Don McLeroy, and current SBOE member, Thomas Ratliff, will also be on the panel. The panel discussion is Sunday, September 25 at 10:15 AM at the Student Activities Center Auditorium, 2201 Speedway, in Austin. For a preview of the panel discussion, check out Jonathan sweeping the floor with Kathy Miller when debating the history standards on CNN last year. As part of our continued coverage of the recently completed legislative session, we will be releasing a series of sit down interviews with key conservative legislators that had an impact on important issues during the session. Our 5th and 6th interviews are with Senator Dan Patrick and Representative Sid Miller. Senator Patrick and Rep. Miller, authors of the Sonogram Bill in the Senate and House respectively, discuss the victory we had this session in passing the Sonogram Bill. Senator Patrick also discusses the key efforts to support and defend the State Board of Education. Today, Liberty Institute launches a series of videos of those most affected by the Houston National Cemetery’s policies and procedures banning the mention of God and prayer during funeral services at the cemetery. Liberty Institute will be back in court on Monday at 9 a.m. for a status conference with Federal District Judge Lynn Hughes in the Rainey et al. v. VA et al. case, which began when Liberty Institute client Pastor Scott Rainey was told he couldn’t pray in Jesus’ name at the cemetery. The three-part video series features statements from members of the VFW District 4 Honor Guard, National Memorial Ladies volunteers, and deceased veterans’ families who were negatively affected by the VA’s policies and practices banning “God” and prayer. For more than 20 years, the VFW District 4 Honor Guard has performed the VFW burial ritual, which was written and approved by the VFW National Council of Administration nearly 100 years ago and includes references to God, at the Houston National Cemetery. The new Houston National Cemetery Director Arleen Ocasio divided the almost century-old VFW burial ritual into two segments: so-called “core elements,” consisting of the flag folding and presentation, Taps, and the rifle salute; and the so-called “additions to the core elements,” speeches with religious elements by the Commander and prayer by the Chaplain. Director Ocasio originally told the VFW District 4 leadership that they could no longer do the “additions to the core elements,” i.e., prayer and speeches referring to God. Subsequently, Director Ocasio mandated that families had to request the entire VFW ritual in writing, while prohibiting the VFW or the funeral homes from telling the families of the elements of the burial ritual or sharing the text of the ritual with them. Official VA policy prohibits the full ritual, unless specifically requested. Please visit www.DontTearUsDown.com to sign our petition asking the VA to stop this religious discrimination. As part of our continued coverage of the recently completed legislative session, we will be releasing a series of sit down interviews with key conservative legislators that had an impact on important issues during the session. Our 4th interview is with Rep. Charlie Howard. We talked with Rep. Howard about the important battle to defeat the expansion of gambling in the state of Texas.